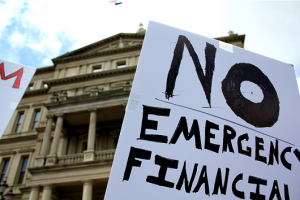 Less than a month after the Emergency Management legislation implemented by the Snyder Administration was defeated on Election Day, a new version of a similar policy has been introduced into the Michigan Senate. To jump start a campaign to defeat this new legislative proposal, Michigan Forward has organized a lobbying day in Lansing on Wednesday, November 28. Michigan Forward is calling people to Lansing to meet with their state officals and demand that they not support SB 865. The event will kick off at 11:00 A.M. at Central United Methodist Church in Lansing (located 215 North Capitol Avenue — corner of Allegan and Capitol).